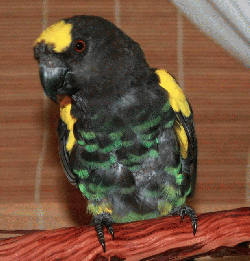 I`m a sweet Meyer`s Parrot who just arrived. A good samaritan neighbor stepped in and rescued me after I was left behind when my family moved away. No one can understand why anyone wouldn`t want to keep me since I am a pleasant fellow who enjoys the company of people. I am friendly, like head scratches and human attention. So far I have not shown a preference for men or woman and am equally kind with both. If you`re looking for a low-keyed and good natured companion, I am looking for a forever home of my own-- maybe we could be a match! Please contact my coordinator to find out how you can adopt me or ask for more information.